Most mobile apps these days need some form of backend (e.g., messaging apps send messages through the cloud, notes apps have to sync online, and shopping apps need to know what’s for sale from a server API). From data storage, file storage, online features to functionality and APIs to tie them all together, apps need a variety of backend services. AWS provides the resources to create and manage the backend but can be overwhelming and intimidating. And what’s best is that it almost all works together seamlessly and often effortlessly. AWS provides tools like Amplify CLI (command line interface) to allow the developer to design what they need and AWS implements the definitions in the services required. Also, in many cases the SDK provides the code for the mobile app project as well. 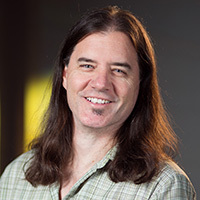 Bear Cahill has been developing software professionally since 1990 for companies such as IBM, Ericsson and Travelocity and freelance since 2008. He’s developed in most languages, on most platforms and most size companies. He wrote “iOS in Practice”, teaches iOS/Android development around the US for various companies. Bear also records online courses, tutorials and walk-throughs for various companies. Having developed well over 100 mobile apps using most available frameworks, Bear has also developed various backend solutions with Parse Server, Firebase and AWS. Exercise: 20 - Create your first Lambda function.